In Room 44 of the National Gallery, London, sitting quietly is Bathers at Asnières, 1884, I forgot this was in the collection and it blew my socks off, like bumping into a major celebrity in the aisles of Tesco or perhaps Marks & Spencer. I was even more delighted to discover a little dog, sitting obediently by its owner in the bottom left hand side above Seurat’s signature. It is barely able to contain its excitement as the boy perhaps makes the sound of the factory whistle in his cupped hands. In our new age we can empathise with the irrepressible natures of Seurat’s anonymous subjects as they find space to express their humanity at odds with the encroaching industrial and technical revolutions. The factories are demoted to the horizon; the heat haze seems to diminish their power. Bathers are a commonly re-visited theme by artists and through our social evolution over the centuries since the early renaissance depictions of privalege, this dogma has been a useful foil to record the human experience juxtaposed to a changing world. Cezanne and Renoir obviously are key to the movement towards a re-interpretation of classism and these modernist interpretations de-construct the privileged aristocrats dipping their toes into their private lakes. Modernism and post modernism share this socialistic utopia bringing everyone into the previously elitist experience and with painting the original compositions can be literally re-interpretaed as a universally shared human need. Photographically we are left only with realist interpretations, some romanticised, commercialised and sexualised like Bruce Webber’s beautiful perfect boys in Bear Pond on a Gold Day and Ryan McGinley’s carefree youth’s. Other artists reflect a more overtly political perspective as in Seurat’s painting, Boris Mikhailov’s great series ‘Salt Lake 1986 reflects the notion of humanity finding a way to express itself under the most extreme circumstances. We will always find a crack of hope, which is the starting point in the eventual defeat of any oppressive state, it is why any limiting dogma is so painful to endure, it is not natural. The Bather motif is an opportunity for photographers to work with nakedness, particularly away from the commercial stereotype we have an opportunity to explore the bodies of the ordinary human beings not narcissistically sculpted to glamorise the status quo (lovely and addictive as it is) but to celebrate the oppressed and hidden beauty of everyday humanity normally hidden from view, shamed by the unachievable perfectionism that sells us Mars Bars, now brightly lit and brought back into the foreground out of the shadows. 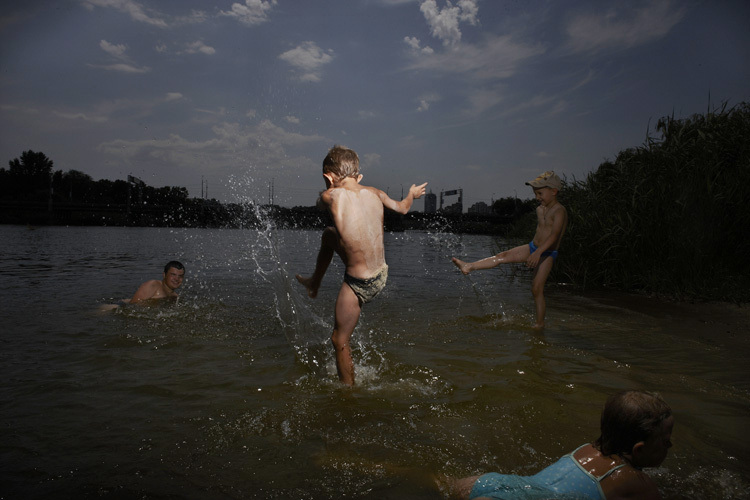 My bathers in Ukraine are to a greater extent defeating the societal introjections more successfully than myself and I am celebrating this and I am inspired by their example but my objectivist approach also exposes a vulnerability and a sense of humanity under attack that I share with Rineke Dijkstra’s beach teenagers. Both works are infected by the power of Botticelli’s Venus but the Venus in my work is a boy (Image_1664).